Find HUGE DEALS On A Used Toyota Highlander In GA! For those of you who live near the Thomasville, Georgia area, it’s as if you have the whole world at your fingertips. You’re in a central location when it comes to visiting big cities like Atlanta or taking road trips to one of Florida’s beautiful beaches. If this sounds like you, you’re going to need a dependable, spacious vehicle that gets you from point A to point B. At Thomasville Toyota, we offer an extensive pre-owned inventory filled with a wide variety of cars, trucks, SUVs, and vans. Don’t believe us? Take a look at our selection on our site. To help you narrow down your search, be sure to select from the various filters such as year, price, make, body type, fuel type, mileage, and more. You’re certain to find a ride you love! If you’re looking for an SUV that will provide all the space you need when it comes to traveling across the state or heading to the beach, we recommend the Toyota Highlander. With countless features and a spacious cabin for passengers, cargo, and more, the Highlander is an excellent choice. To help you learn more about all the Highlander has to offer, we’ve taken a closer look at the 2017 model below. Keep reading for more information! The 2017 Toyota Highlander is offered in six separate trim levels: LE, LE Plus, XLE, SE, Limited, and Limited Platinum. The base LE comes with a 6.1-inch touchscreen, cloth upholstery, a 60/40-split third row seat, an auxiliary audio jack, a rearview camera, 18-inch alloy wheels, a CD player, five USB ports, heated mirrors, a 60/40-split second row seat, a windshield wiper de-icer, Bluetooth®*, and the Toyota Safety Sense bundle which provides a wealth of safety features such as lane departure intervention, automatic high beams, adaptive cruise control, automatic emergency braking, and forward collision mitigation. The LE Plus provides a leather-wrapped steering wheel, an 8-inch touchscreen, satellite radio, a height-adjustable power liftgate, tri-zone automatic climate control, HD radio, an eight-way power driver seat, upgraded upholstery, and fog lights. The XLE offers keyless entry and ignition, an auto-dimming rearview mirror, leather upholstery for the first and second rows, Driver Easy Speak, simulated leather third row upholstery, an upgraded instrument panel, rear cross-traffic alert, a sunroof, blind-spot monitoring, second row sunshades, roof rails, and navigation. Equipped similarly to the XLE, the SE trim gains LED running lights, 19-inch wheels, rear parking sensors, and sport-themed elements. The Limited adds the contents of the XLE in addition to driver memory settings, a 12-speaker JBL audio system, heated and ventilated front seats, LED running lights, rear parking sensors, and a rear cargo cover. Drivers who choose the Limited Platinum – the top trim – will receive a 360-degree parking camera, a panoramic sunroof, front parking sensors, automatic wipers, a heated steering wheel, and Safety Connect emergency communications. With countless technology, safety, and comfort features, you and your passengers will enjoy every moment spent in the Toyota Highlander! 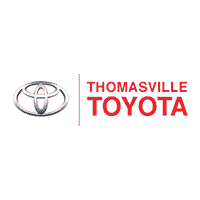 When you choose Thomasville Toyota, you’ll immediately recognize why so many people choose us. First of all, you’ll be greeted by our friendly employees who will assist you in any way. We’ll listen to your concerns, answer your questions, and help you go over your options. On top of that, we’ll show you around our dealership and let you take a test drive or two. In addition to our excellent service, we provide numerous deals and specials for you to take advantage of. There’s only one catch – our specials won’t last forever. In fact, the prices you see on our site today could change by tomorrow, so take advantage of our deals today. Don’t miss out on saving big with us. After all, you don’t want an incredible offer to slip through your fingers! We are conveniently located at 14724 US 19 South, Thomasville, GA 31757, which means residents of Albany, Camilla, and Bainbridge are just a short drive away. We provide a stress-free and hassle-free environment for shoppers, so stop by today to browse our extensive inventory. Feel free to stop by Monday – Friday from 8:30 a.m. to 8:00 p.m. and Saturday from 8:30 a.m. to 6:00 p.m. We look forward to seeing you soon and putting you behind the wheel of your dream vehicle!